As Florida’s state animal, the Florida Panther has a special place in the hearts and minds of Floridians. It is Florida’s state animal, but also one of the most endangered species since 1967, with an estimated 80 Florida Panthers remaining in the wild. About 30 to 35 juvenile and adult Florida Panthers wear radio collars to help monitor the panther status. They are threatened by intense destruction of their habitat, collisions with automobiles and genetic defects caused by extensive inbreeding. Historically, Florida Panthers lived in Florida, South Carolina, Georgia, Mississippi, Louisiana, Arkansas, Alabama, Tennessee, but today only a small population lives in Southern Florida’s Everglades and Big Cypress Swamp. The Florida Panther National Wildlife Refuge is located approximately 20 miles east of Naples, Florida. The south boundary of the refuge parallels I-75, the east boundary follows State Road 29 and private lands border the north and west. Sharing common boundaries with Big Cypress National Preserve and Fakahatchee Strand State Preserve, the Refuge is essential to the survival of the panther, which in turn acts as a barometer for other species’ survival and the health of the ecosystem as a whole. The Florida Panther Conservation Bank, working with the Big Cypress and Florida Panther National Wildlife Refuge as well as the US Fish & Wildlife Service, Florida Panther Recovery Program and many private organizations are like-minded organizations that have made efforts towards the restoration of this magnificent and yet most endangered mammal in it’s natural habitat within the state of Florida for future generations. 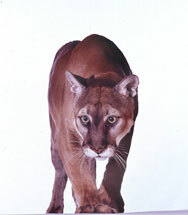 Copyright © 2009 Florida Panther Conservation Bank | All rights reserved.